The Cypress String Quartet has been in town this week as artists-in-residence at the University of Utah’s Chamber Music Workshop. Tuesday, they played a concert that showed that the ensemble is at the top of its game and one to be reckoned with. The San Francisco-based group played a magnificent program of Beethoven, Schubert and Dvorák — all composers with whom they are closely connected. The evening began with Beethoven’s E flat major Quartet, op. 74, Harp. While this work was written towards the end of Beethoven’s middle period, its structure, harmonic language and melodic construction hark back to the late 18th century quartets of Haydn and Mozart. But there is no mistaking that this work is by Beethoven in its abrupt shifts in accents and expressions. Because of this, the Harp is one of the composer’s more interesting quartets. 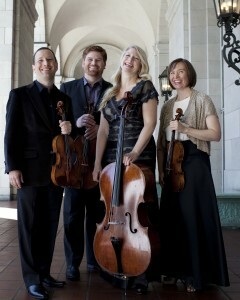 The foursome gave a well defined and articulated account that captured the “Beethovenisms” wonderfully. The music was sensitively expressed and they brought a keen layer of lyricism to the work, including to the Presto third movement. Their interpretation was spot on and displayed their affinity for the composer’s music. They followed the Beethoven with Schubert’s short Quartettsatz. Once again, the group showed its remarkable interpretative skills as it probed the contrasting sections with great sensitivity. The four infused their playing with passion, feeling and a wonderful vibrancy that brought depth and dimension to this one-movement quartet. The ensemble closed out the program with an insightful reading of Dvorák’s Quartet in E flat major, op. 51. The four brought out the charming attractiveness of the music with their sensitive playing that captured all of its minute nuances. Their interpretation was energetic and exuberant, yet never lacked lyricism and refined expressiveness. It was played the way Dvorák deserves to be played.